In order to encourage exhibitors to attend an Open dog show the Kennel Club introduced the Show Certificate of Merit.An Open Show is a dog show that is open for entries from any breed of dog that is registered with the Kennel Club. 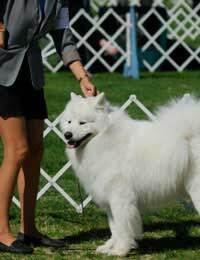 These types of shows can be found all over the country every weekend and are ideal places to start a dog showing career. For breeds that don't have classes specifically for them there are variety classes where they can compete against others in their group. Some Open shows are judged on the group system. This means that once a dog has won its class and is then declared the best of its breed they compete for one of the four places in its group. There are seven groups; pastoral, working, gundog, terrier, hound, utility and toy. The winners of the seven groups then compete for the best in show title. For shows not judged on the group system all best of breeds enter straight into the best in show competition. There can also be group open shows which are organised for each of the seven groups individually. How Do I Win the Award? 1 point for best any variety not separately classified (avnsc) - either best working avnsc, best avnsc toy etc or just best avnsc in show. 4 points for single group best in show. 5 points for best in show. 3 points for Reserve Best in Show not judged on the group system. Multi group placings: 1st = 4 points, 2nd = 3 points, 3rd = 2 points, 4th = 1 points. Puppy groups do not count. When Can I Claim From? The Show Certificate of Merit was introduced on 1st January 2003 so any points won from that date can be used towards your claim. This award was introduced to encourage people to enter their dogs at Open Shows rather than just attend the larger Championship Shows. The Open Show is usually run over one day and you are always able to find one in the vicinity of the area that you live rather than travel for many miles as is the custom with the majority of Championship shows. Entry fees are lower and class numbers are quite often smaller. There will often be only four to six classes for each breed but then the dog can be entered in other classes, known as stake classes and variety classes,if the owner wishes. A form can be obtained from the Kennel Club by post or downloading from their website Apart from being awarded a certificate from the Kennel Club your dog will be able to have the title of Show Certificate of Merit (ShCM) after its name.The certificate and confirmation of the award can take up to six weeks to arrive during the height of the show season. I am trying to work out my points for the show certificate of merit, aand my birch has won AV Veteran group (pastoral), does it count oor not.